Former Vice President, Dr. Alex Ekwueme has been confirmed dead in a London clinic. Ekwueme was said to have died late Sunday night after he battled with what the family said was a chest infection. 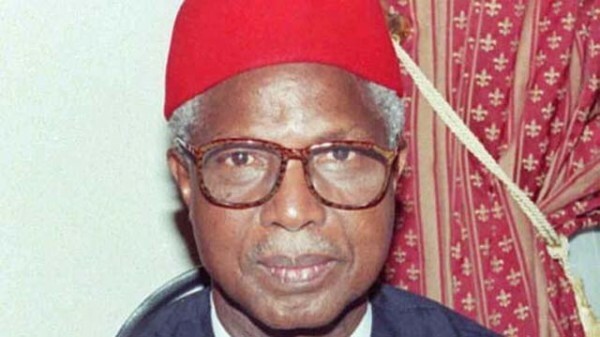 Confirming his death in a statement‎ early Monday morning, Ekwueme’s younger brother and tradional ruler of Oko community in Anambra state, HRH, Prof. Laz Ekwueme said the sad event occurred in London at about 10pm Sunday night. “The Ekwueme family regrets to announce the peaceful passing away of their patriarch, the former Vice-President of the Federal Republic of Nigeria Dr Alex Ifeanyichukwu Ekwueme GCON. “The sad event occurred at The London Clinic at 10:00 pm on Sunday 19th November 2017. Ekwueme suffered stroke two weeks ago and was stabilised in an Enugu hospital before a Federal Government Ambulance aircraft flew him to London. He became the Vice President in 1979 with Alhaji Shehu Shagari as President in Nigeria second republic. His party NPN and also won the 1983 election but they were sacked in a military coup and General Mohammadu Buhari became the Head of State.